New research out of Rutgers University-Newark, University of California San Diego, and the J. Craig Venter Institute shows that increased CO2 in oceans interfere with necessary iron intake in phytoplankton, which support ocean food chains and fisheries and help moderate CO2 levels. A team led by scientists from the Scripps Institution of Oceanography at the University of California San Diego, and including Dr. Adam Kustka of Rutgers University-Newark (RU-N), has demonstrated that the excess CO2 society is adding to the atmosphere interferes with a key and previously undescribed pathway for iron uptake in marine phytoplankton. Phytoplankton are microscopic plants whose growth at the ocean’s surface supports virtually all life in the ocean (including all marine fisheries) and are responsible for removing almost half of the CO2. In the March 14 edition of Nature, the team demonstrates that a mechanism widely used by phytoplankton to acquire iron has a requirement for carbonate ions. 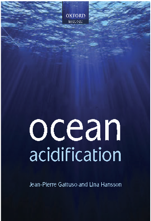 Ocean acidification is poised to decrease the concentration of sea surface carbonate ions 50 percent by the year 2100. Phytoplankton growth is constrained by low levels of iron in vast regions of the ocean, yet this growth helps moderate CO2 levels. Anything that further impacts phytoplankton growth in this regions may further restrict the ocean’s ability to absorb CO2. 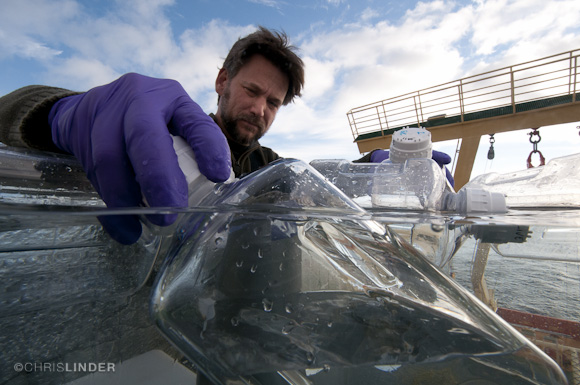 “In such a scenario, excess atmospheric CO2 increases the acidity of the oceans, slowing phytoplankton growth rates and reducing the biological drawdown of CO2, which ultimately allows higher amounts of CO2 to accumulate in the atmosphere” said Jeff McQuaid, lead author of the study who made the discoveries while a graduate student at Scripps. “Rapid ocean acidification has been a factor in several major extinction events in the earth’s past” added Andrew Allen, a biologist with a joint appointment at Scripps and the J. Craig Venter Institute, and senior author of the study. “Marine scientists have spent decades investigating how phytoplankton are able to grab such low concentrations of iron from seawater and internalize it. Understanding the mechanism of iron uptake is critical to develop meaningful predictions on how phytoplankton may respond to future ocean conditions, but this understanding has been elusive”, says Adam Kustka, a trace metal physiologist and collaborator in the Department of Earth and Environmental Sciences at RU-N.
“Jeff approached me at an Ocean Sciences meeting, and shared data suggesting that diatoms (an important group of marine phytoplankton) use a mechanism that is similar to the one used by our own blood cells,” said Kustka. “In our bodies, ‘free’ iron levels are purposefully kept very low to keep invading germs from gaining a foothold, and our blood cells evolved a so-called ‘transferrin’ to get at these low levels. Similarly, iron levels in vast regions of the open oceans are so low that marine algae had to evolve special tricks to get at this iron. In both our blood and the oceans of the world, this pressure to evolve highly effective ways to take up iron have independently led to the same solution”. “The appearance of phytotransferrin some 700 million years ago is consistent with a time in the earth’s history marked by massive changes to ocean chemistry, and this ancient history explains why no one has made this connection before” said Miroslav Oborník, a molecular evolutionary biologist from the University of South Bohemia and co-author on the paper. Jeff visited Dr. Kustka for several months at RU-N, where he worked in the trace metal clean radioisotope facility at the Department of Earth and Environmental Sciences and gained experience measuring and modeling iron uptake. This work, supported by National Science Foundation, the Gordon and Betty Moore Foundation, and the Department of Energy, opens up new avenues for understanding the biochemical underpinnings for acquiring this scarce nutrient. 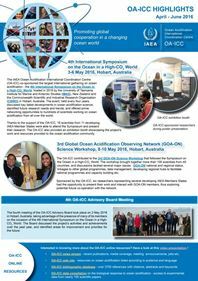 The international research team also included Theodor Kindeberg, Andreas Andersson, and Katherine Barbeau from Scripps Oceanography in addition to McQuaid and Allen; Aleš Horák from Biology Centre ASCR, Institute of Parasitology and University of South Bohemia, Czech Republic; and John P. McCrow, Bogumil J. Karas, and Hong Zheng from the J. Craig Venter Institute. Rutgers University, 15 March 2018. Press release.